Hey! That’d be a good name for a band! But these sparrows don’t sing, these sparrows are your Silent Uncommon Cinnamon Waxwing Sparrows, a rare species found only in the upper reaches of Michigan near the shores of Lake Superior where seagulls fly overhead. In late May these sparrows will search out the nearest farmers market, find a table of like-smelling, sweet-smelling critters and objects, and throughout the summer beg to be bought. 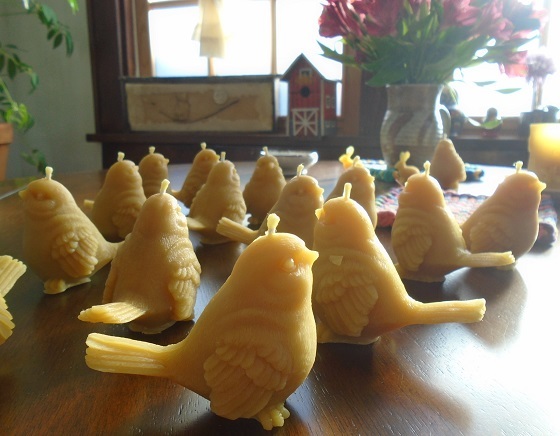 Also: a herd of Rare Beeswax Rabbits. Another rarity (yes) as most are short-lived. Their ears are extremely fragile, finely tuned, easily broken, and a broken ear means death. (Oh no, I’m melting!) Also, due to excessive in-breeding, many Rare Beeswax Rabbits are born with only one ear and so are quickly and mercilessly snuffed. Harsh, yes. Cruel, yes. True, yes. But there are survivors. Then along came The Angels of Candelilla Wax. Another good name for a band? Okay. 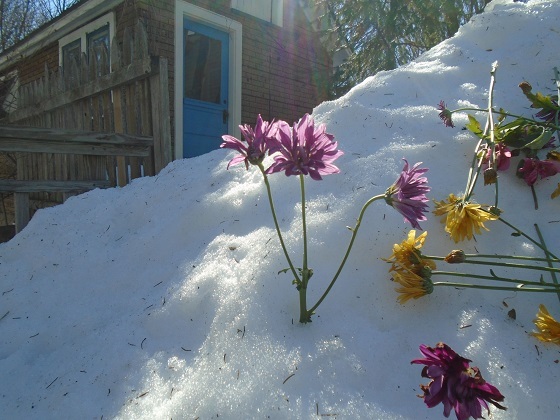 So the farmers market is two months away and there’s still a foot or two or three of snow on the ground, and some days it feels like winter, some days it feels like spring, and the “somedays” pile up. A weird thing happened. I went out, to a free concert, over at the university. A piano, a singer, a mezzo-soprano named Kelley O’Connor. She was wonderful, it was wonderful. Not at all what I usually do, where I usually go. In this clip, she is the woman in black. A bit of a musical theme develops. Perhaps those sparrows sing after all. At the used book sale at the library I picked up a record album, fifty cents. 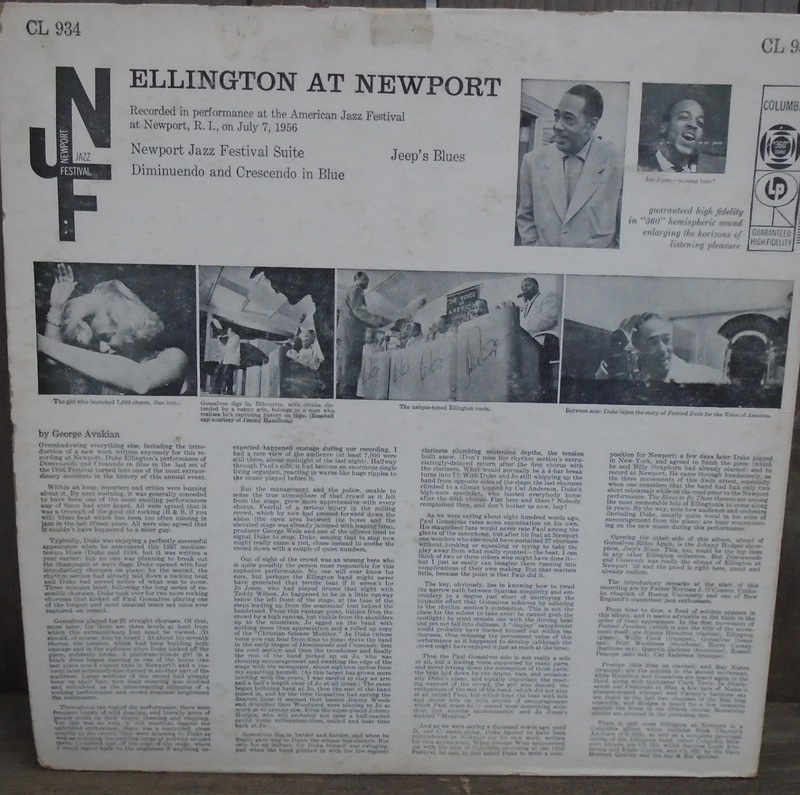 Ellington at Newport. It is incredible. Recorded live. I bought it because I like the Duke and the cover reminded me of an Ella record I’d been listening to. Little did I know that in the last song there is an historic sax solo. “Within an hour, reporters and critics were buzzing about it … Gonslaves played for 27 straight choruses … ” The liner notes are agog with it. “ … Gonslaves dug in harder and harder, and when he finally gave way to Duke, the release was electric … ” When the needle on my turntable finally struck that groove, that groove of Diminuendo and Crescendo in Blue (for I had to listen to the album through from Track One, why miss a thing? 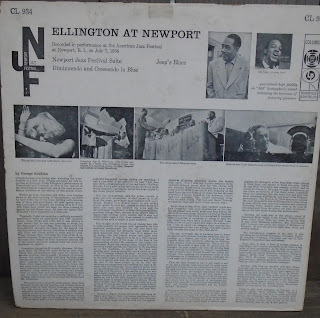 ), I was, well, primed, and “ … there were frequent bursts of wild dancing … ” and not only at the Newport Jazz Festival 1956. Josie can be hard to contain. Unfortunately, there doesn’t seem to be a video of this event. But this performance is well worth hearing and the back of the record jacket, written by George Avakian, is well worth reading. Oh, that print’s awfully small, isn’t it.